Parry & Pfau, personal injury attorneys in Las Vegas, are pleased to promote higher education and give back to the community with a scholarship for creative and safety-minded students. The winner will be selected based on creativity, originality, and quality based on the subjective opinions of the Parry & Pfau Scholarship Selection Committee. The application must be submitted via the online form that can be found here. The video must be uploaded to YouTube prior to submitting the form, as the form requires the YouTube link to be included. Record a one- to two-minute video responding to the following prompt (video can be filmed on a smartphone, digital camera/camcorder or webcam and must be recorded in the “landscape” (long) format rather than “portrait” (tall) format). Car crashes don't happen by accident. Explain why the word, "accident" is not an accurate description of a motor vehicle collision. Originality is crucial. Creativity is a must. Humor is appreciated if you can implement it without making light of a serious subject. Upload the video to Youtube. Make sure you put “Parry & Pfau Scholarship 2018” in the title of the video. Also ensure that the video is not marked “private,” or we will not be able to view it. Instructions for uploading a video on YouTube can be found here. Applicants may submit entries from September 1, 2017 through July 31, 2018. Winner will be announced and awarded the scholarship by August 15, 2018. One (1) winning applicant will receive a $1,500 scholarship. Award money is to be applied to cover winner’s educational expenses in the field or major of their choosing. The receipt of this award by the winner is subject to the following conditions: All monetary awards must be applied to cover winner’s college, university, or vocational school tuition and education-related expenses, such as room and board or books and supplies. Under no circumstances should monies awarded to winners be used toward non-educational expenses. Winner must also submit a W-9 tax form to Parry & Pfau. Parry & Pfau reserves the right to terminate this promotion without notice as deemed appropriate to Parry & Pfau. Notwithstanding said termination, the scholarships will be awarded as set forth in these Official Rules. Parry & Pfau is not responsible for any incorrect or inaccurate information, technical error, or human error which may occur in the processing of entries and submissions. Parry & Pfau assumes no responsibility for any error, omission, interruption, deletion, defect or alteration of entries. Parry & Pfau reserves the right, in its sole discretion, to cancel, terminate, modify or suspend the Parry & Pfau Scholarship, in whole or in part, at any time. Following the July 31, 2018 deadline, Parry & Pfau will contact the winner via email. One (1) winner will be selected from among the applicants, notified and announced by August 15, 2018. The odds of winning depend on the quality of each entry and the number of applicants. The decisions of judges are final. Winner will be notified via email. Submission of application constitutes permission (except where prohibited by law) to use winners’ names, cities, states, likenesses and/or voices for purposes of advertising, promotion and publicity without compensation. Awards will be sent to the winner after all required proof and documentation is received. By entering, participants agree to be bound by these Official Rules and the decisions of Parry & Pfau, which shall be final. All applicable federal, provincial, state, and local laws and regulations apply. Except where prohibited by law, participation constitutes the participant’s consent to Parry & Pfau’s use of their names, cities and states of residence, and entries (videos) for advertising, publicity, and promotional purposes in any media, online or offline, without further permission, consent, payment or other consideration. If, for any reason, the promotion is not capable of running as planned, including infection by computer virus, bugs, tampering, unauthorized intervention, fraud, technical failures, or any other causes which corrupt or affect the administration, security, fairness, integrity, or proper conduct of the promotion, Parry & Pfau reserves the right, at its sole discretion, to cancel, terminate, modify or suspend the promotion and to select winners from among all eligible entries received prior to the date of termination. 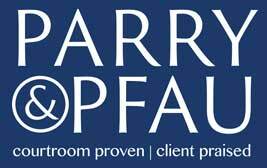 Parry & Pfau reserves the right to amend or modify the Terms & Conditions at any time during the promotion.